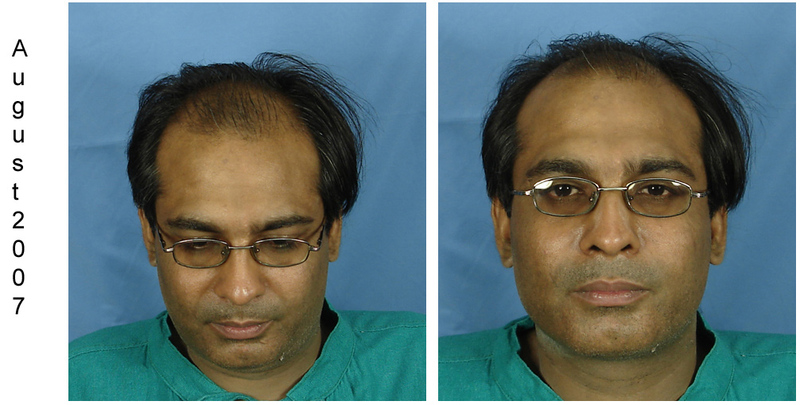 Sunil underwent a 5315 FUHT + 110 beard hair graft procedure in August 2007 at our clinic. Here are some pictures documenting his result at 1 year after his procedure. Modern, all follicular unit hair transplants look very natural and can make a remarkable improvement in the appearance of a bald or balding person. Moreover, such hair transplants are no longer only for the celebrities. Therefore, instead of showcasing celebrities, we present to you a common man who has undergone a hair transplant 12 months ago. We present him in a variety of everyday settings.Walking in the garden, strolling in the market and going for a haircut. A thorough shampoo and wash is probably one of the toughest test for any hair transplant. As you can see, Suneel’s transplanted hair look absolutely natural even after the shampoo. Here you see the famous, celebrity hair stylist Jawed Habib, giving Suneel a haircut and a brand new hair style. Superb result and the video is excellent. I appreciate the time and effort that must have gone into making it. I liked the shampoo part. It gives a good idea how all weather proof the hair transplant is. Otherwsie, most times, one reads how transplanted hair will never be thich enough. Great work as always. For those who do not want to navigate to other links for the video, here’s the video embedded in the forum, click PLAY button to view. » 2007 at our clinic. Wow, great transformation. He looks 10 years younger. Good work Dr.
Thats another wow result. Its amazing how you guys keep springing one extraordinary transformation after another. You are the world’s best HT clinic. keep it up.